You can use the Starter Game sample to see how Lumberyard systems work together to make a game. Starter Game is a small, third-person game that is built with the Lumberyard component entity system. In addition to component entities, Starter Game demonstrates bipedal locomotion, voxel-based global illumination, the time of day system, and more. In this sample, you play as Jack, a robot that has crashed on a distant planet. Jack can explore the world and must defend himself against enemy robots that occupy the planet. You can use Jack or any other assets in the Starter Game sample to prototype your own projects. The Starter Game sample is included in the engine package. The Starter Game sample download includes the latest features and improvements that are not yet integrated into the sample that's included in the engine package. An example is the Starter Game Action Update. 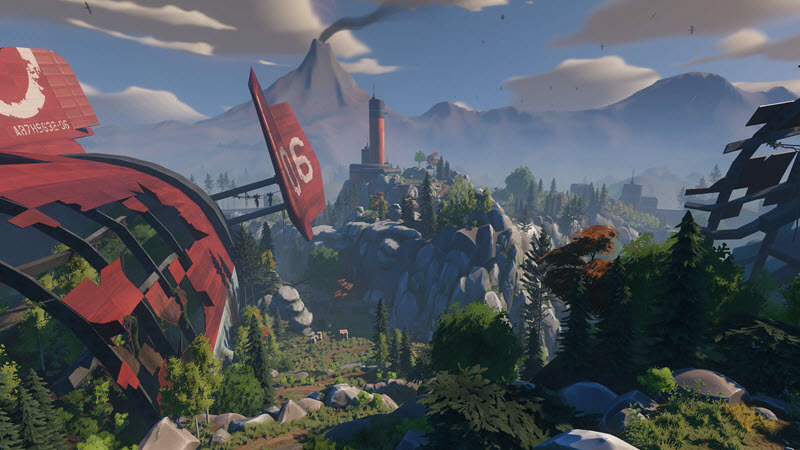 The download includes the Starter Game sample that is supported in the previous version of Lumberyard. For example, if the newest version is Lumberyard 1.11, this download is supported in Lumberyard 1.10. Currently, only Windows supports the Starter Game sample. When deployed to console platforms, the audio in Starter Game is set to null by default. The free Wwise LTX license distributed with Lumberyard supports PC games, but deploying audio to consoles requires a full Wwise license. If you have been making your own changes to Starter Game and don't want to lose your work when upgrading from Lumberyard 1.9 to a newer release, see Upgrading Your Starter Game Project. Download the StarterGame.zip package from the Downloads page and extract it to your Lumberyard directory. For example, \Lumberyard\1.x.0.0. Use the desktop icon to launch the Project Configurator. In the Project Configurator, select Starter Game. Click Set as default. Close the Project Configurator. In the Welcome to Lumberyard Editor dialog box, click Open level. In the Open a Level dialog box, select StarterGame and click Open. To move forward, strafe left, move backward, and strafe right, press the W, A, S, and D keys, respectively. To look around, move the mouse. To shoot, click the primary mouse button. To toggle weapon selection, click the secondary mouse button. To toggle time of day, press the < key. For more information about time of day settings, see Creating Time of Day Sky Effects. To change the antialiasing mode, press the > key. For more information about antialiasing, see Controlling Antialiasing. To exit the game, press Esc. If you are running Starter Game in the editor and Jack the robot dies, press Esc to exit the game. The viewport window displays debugging information by default when you are in gameplay mode (Ctrl+G). You can toggle this information on or off by pressing the tilde (~) key. For more information, see Using Console Debug Views.